Don't you just love that meme? So this week I decided to share a few pictures and to tell y'all that I actually had a crafting spell come over me during Christmas! LOL! That doesn't happen often. But, first let me just share my gingerbread men with you. They might make you smile today! Or Hungry! 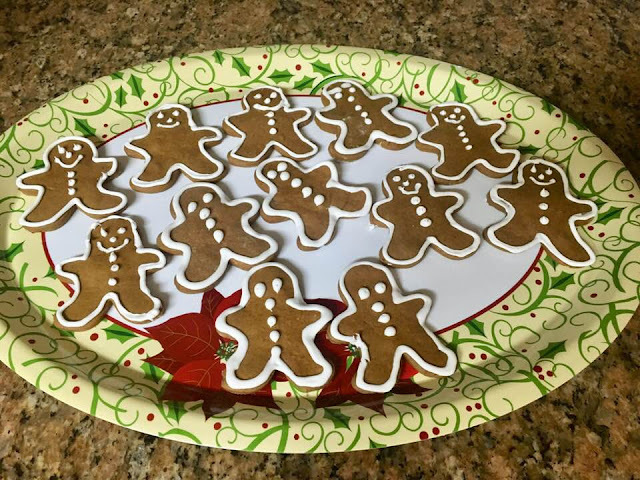 I made some gingerbread men over the holidays for the grands and they were oh so good! Not too shabby for my first time of making gingerbread men. I actually got a little crafty over the holidays which doesn't happen often. Took a piece of wood, sanded it and then spray painted it. Found the song "It is Well with my Soul" online for free so saved it to my computer. Then I found this beautiful red bird clip art for free and saved it. I done a little photo shop magic and placed my red bird on my song with a light opacity. I painted about 3-4 layers of modge podge and let it dry. Added some beads and a Poinsettia that was an old jewelry piece that I had tossed in my craft drawer. Liked how it turned out until.... I went to hang it on my tree! WAY TO HEAVY for my skinny tree. 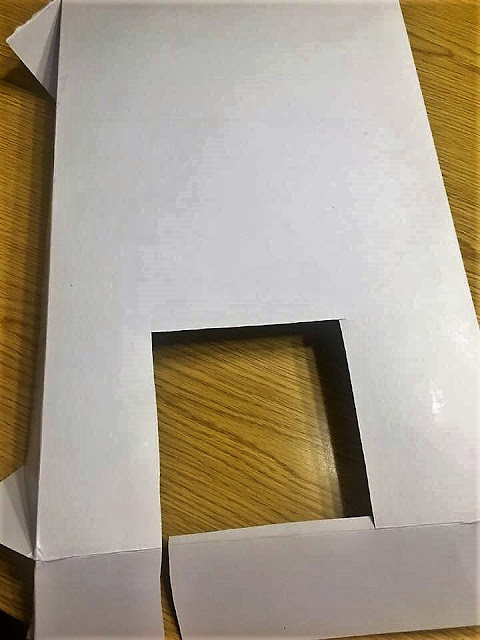 So, I took a white gift box and cut it the same size as the wood. 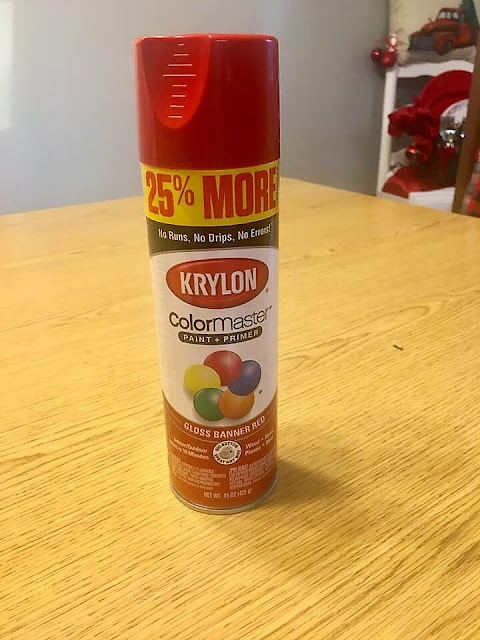 Gave it two coats of spray paint. Hot glued the song onto the cardboard and I painted one light coat of modge podge to basically seal it. Added some beads, an earring (one earring was missing) that I had tossed in my craft box to the corner and a loop to hang it with. Hit the gaps with a tad of gold glitter paint and well, it's not perfect and next time I will use beads that do not have holes in them...but it sure made me smile. A friend told me that crafting was like a marriage....TRIAL and ERROR! 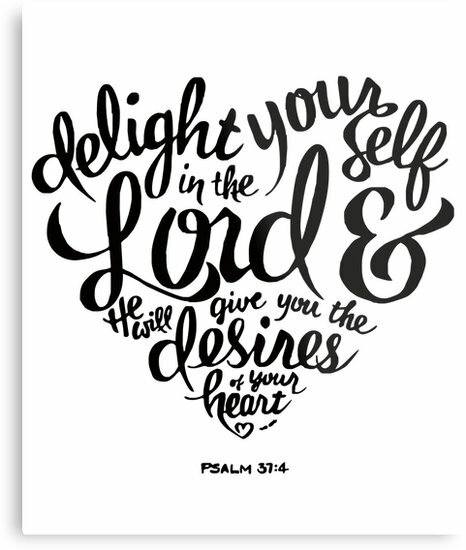 I love the song...It is well with my soul. I love the old and newer version. And red birds...well who doesn't like red birds. I've heard the old saying that if you see a red bird in your yard that you have a visitor from heaven. 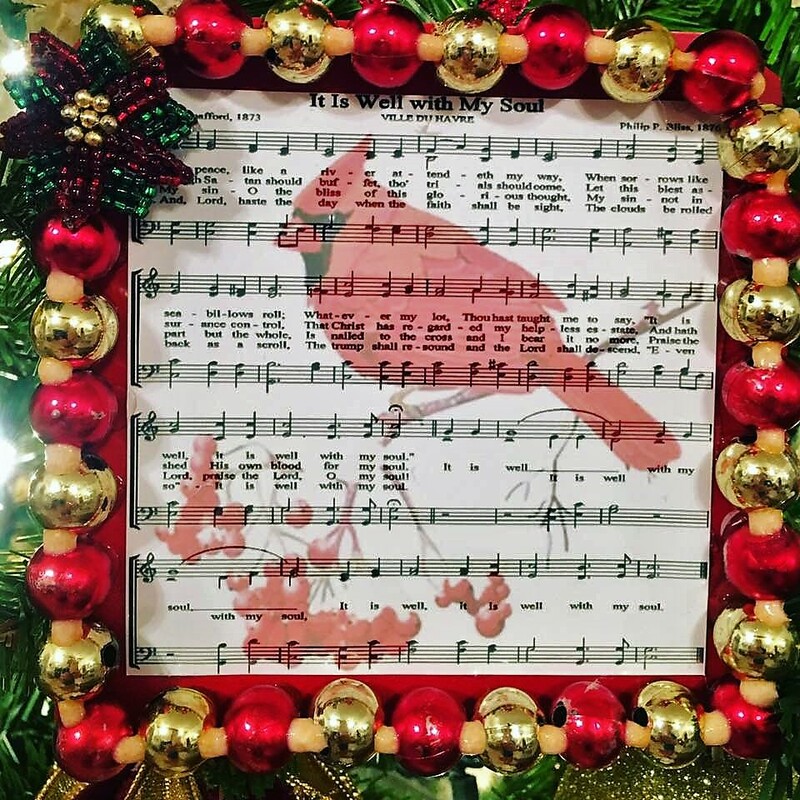 Of course there are a lot of little sayings about the red birds. But, it was a little time of reflecting on those I miss and love. On the back of the ornament I wrote in memory of Papa, Granny and Nanny. My grandparents and my motherinlove. Yep, it was just one of those moments for me. After I had completed that little craft my friend Debby from "My Favorite Things" blog sent me files of some of the prettiest red birds ever! She has taken some of the most beautiful pictures of red birds in her yard. I see a future project using some of her pictures soon. Here is just one of her images that I know she does not mind me sharing. 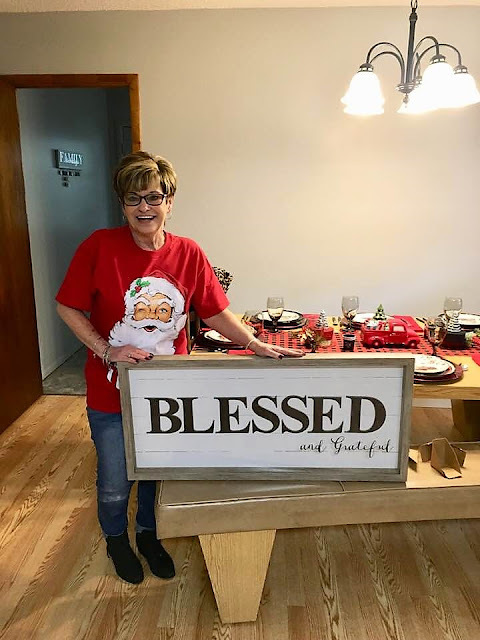 A sweet friend gave me this beautiful Blessed sign for Christmas and I have been needing something to fill a wall behind my dining room table. Well, the sign was perfect but needed a little something else. So, decided to make two wreaths, one for each side of the sign. I have been drying out some cotton that I picked from a cotton field in Georgia. 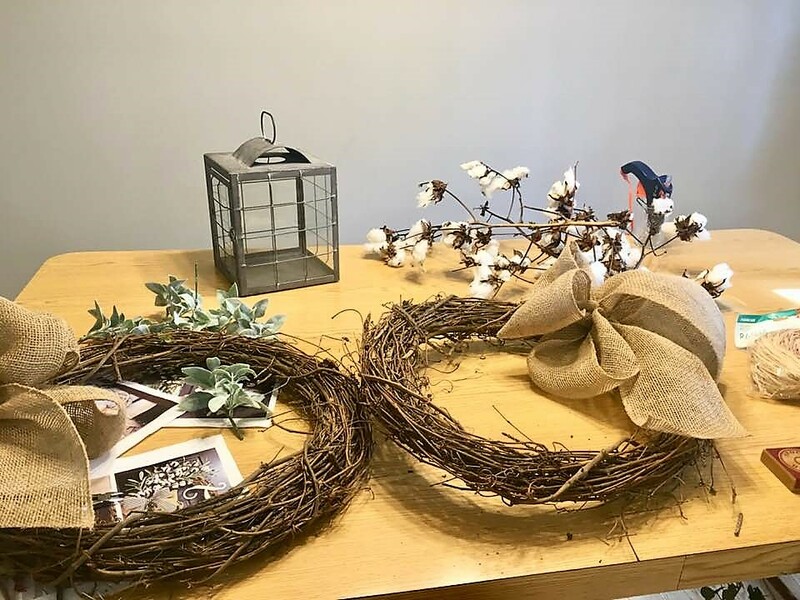 Plan on mingling a little cotton with some burlap and a few other things for my wreaths. Yep, another little craft project. Hey, I gotta do this while I am in the mood! And last picture for the day. Isn't she just the cutest? Look at those cheeks! Her little onesie says, "Ain't no Nana like the one I got". YES, I love it and look at her little head band! I hope that you all have a wonderful week and that you remember; Life is short, live it. Love is rare, grab it. Anger is bad, dump it, Memories are sweet, cherish them. P.S. 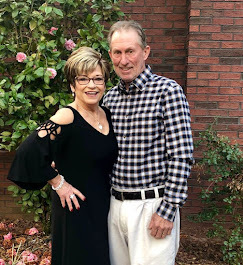 If you get a chance, lift up my friend Debby in prayer...she could sure use a little prayer right now. She is awaiting test results from a biopsy. Thank you Debbie . A bird theme is great for your trees . But then all of your themes looks so good . First, give me that baby! Oh my! She is so cute and the onesie is adorable. Cindy, I love your ornament. I know it had a special meaning for you. I haven't crafted in years. No time it seems and then when I do have time I do not want to do anything. Those gingerbread men turned out cute. 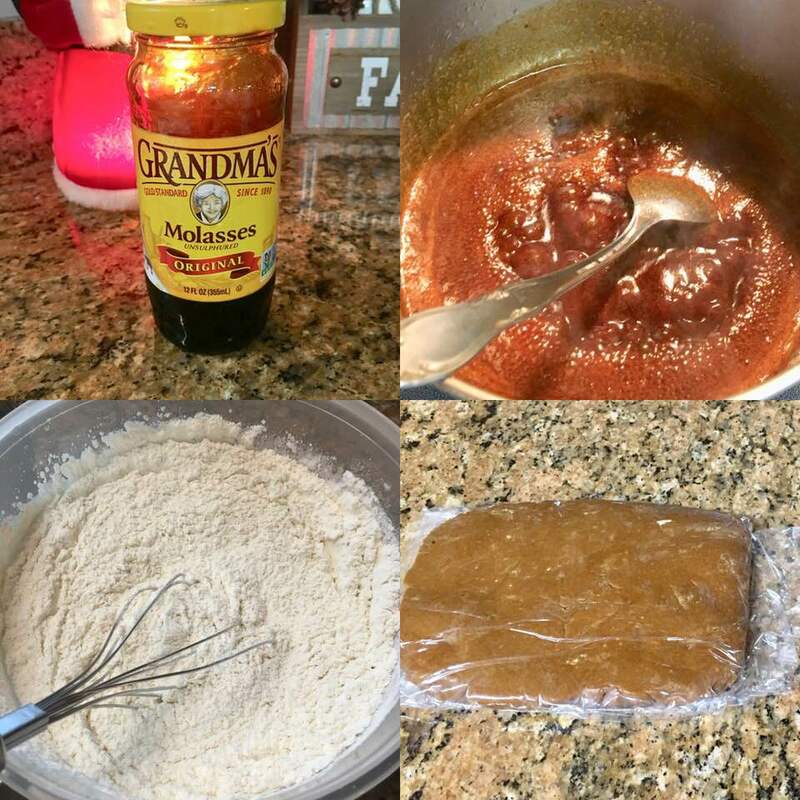 I have never made any. Will pray for your friend this Wednesday in class. I do not need details as God knows. Cindy, your gingerbread men are adorable! I've tried ONCE to make them, it was an epic failure. I stick with gingerbread cake but would love to try the men again if I get brave! :-) I love your craft project! That song is one of my most very favorites...so beautiful! It's so easy to make some beautiful craft projects when we look around our house and the internet. I've got a few things I want to make also, but like you, I have to be in the mood. Your sign will look great on the wall...can't wait to see it and your wreaths! Will keep Debby in my prayers! Love and hugs to you! Have a great one! Benita, those gingerbread men was really good . Especially with s cup of coffee . Yes i love thst sobg too and both versions . But i must sh that after hearing my oldest granddaughter sing the newer version , i was sold ! Thank you for irsyjbf for my friend . She’s precious . Your adorable granddaughter made me smile. 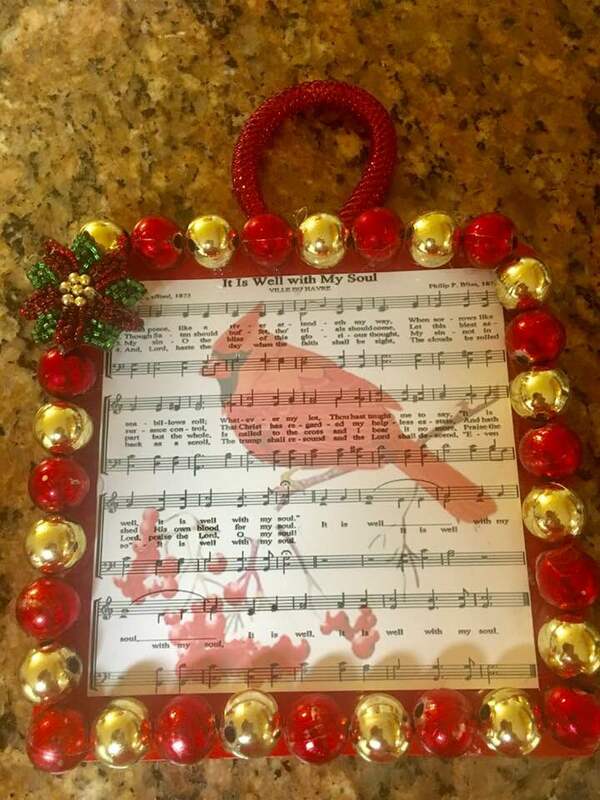 Your cardinal musical piece ornament turned out really well. A few years ago, I tried to do a decoupage craft tutorial by another blogger. Unfortunately, it did not end well and the decoupaged ornaments ended up in the trash. Crafting fail! Debby, so thankful to be able to pray for you . Prayer is such a wonderful gift. I love that song too . I can’t hsrfky hear it without crying . Keeping you bathed in prayer dear friend . Love your crafty side! That turned out so cute and in your RED! Those gingerbread men did make me smile and hungry!! Love that sign too. Baby girl is too sweet! Thanks Heather Lou. I wish I had one of those gingerbread men to go with coffee for later. LOL! A Crafting Mood, how fun! Especially, at Christmas time. I like how you paid homage to those special people in your life. So sweet! Yup, she is a cutie! That smile will melt anyone's heart, especially yours, I bet. Thanks Christine. Yep, that baby girl is the sweetest. She is such a good baby too. Cindy, I love those gingerbread men and what great memories your grands will have of them! When I taught kindergarten years ago, we teachers made ornaments for our students out of gingerbread. We used a different recipe than one you would eat but they sure were cute hanging on our Classroom tree! Some of the kids said for years after that they still had those ornaments. How special is that! 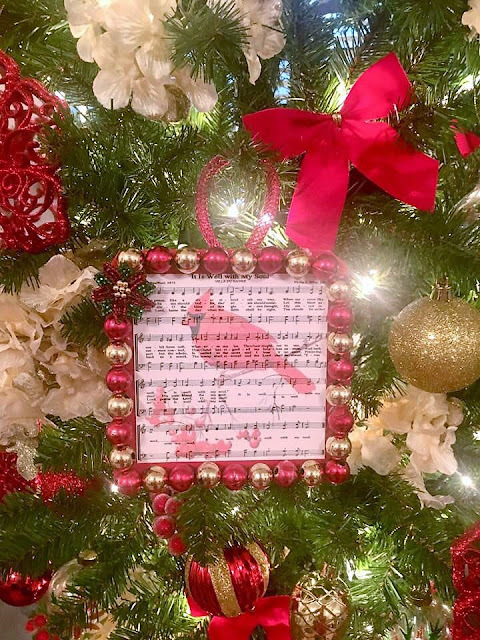 Your cardinal ornament is so pretty! Great job! I’ve been working on a bit of genealogy over the holidays. It’s slow progress but very interesting. I’m back to watching little Jack this week and having lots of fun with that. Hope you have a great week, Cindy! Sounds like your gingerbread men was fun. I love it that some of the kids kept them too. How sweet and memorable. My sister is doing some genealogy and sharing with me and it has been very interesting. I know you are having fun with Jack. I can see you now kissing him all over his face. LOL! LOVE the song craft you made, and your gingerbread men were just adorable! And, that onesie! Oh, my word, that baby is a living doll!! SO sweet! I don't know how you can stand to ever let her go home! LOL! Yes, I am surely lifting dear, sweet Debby and so concerned about her. I am waiting for God to show up and heal her and show everyone His amazing power in her situation. Many hugs to you today! Thank you Cheryl. That baby sure has our hearts. Yes, keep Debby in prayer. She is so precious. She trusts the Lord and loves Him so much. Thanks for your sweet words my friend. Your cookies and your crafting creations look wonderful, Cindy!!! 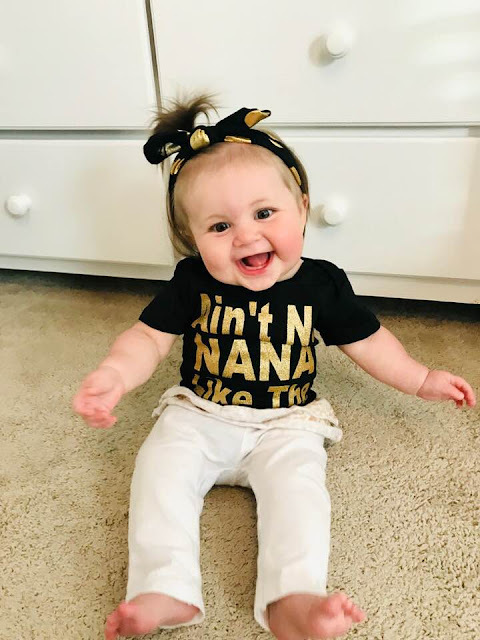 Your baby granddaughter is just the cutest and that SHIRT...it is perfect! She just makes me smile with her happy little self and cute smile. Debby sure does take beautiful pics and I will keep her in my prayers, along with you. Thank you Kitty. Yes I loved her little onesie. When I saw it I had to get it for her with that adorable headband. 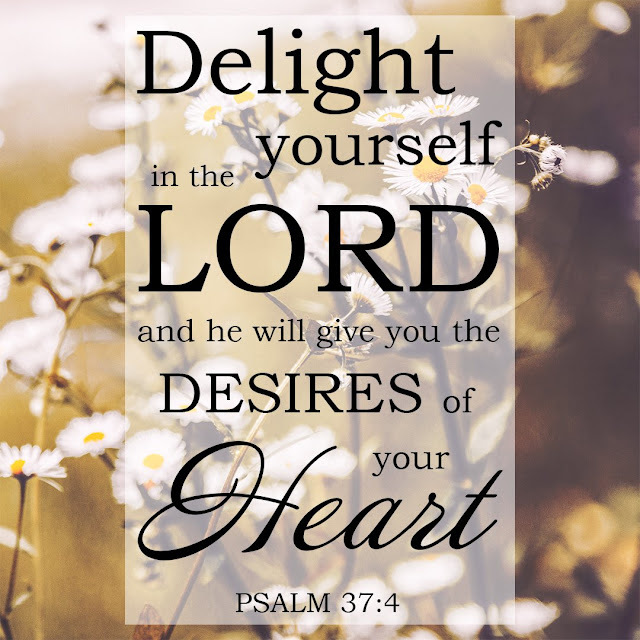 Thank you for praying for Debby. Thanks BJ. I appreciate you coming by. Cindy, you did an outstanding job on your gingerbread men! That has been a tradition I started at least 30 years ago. 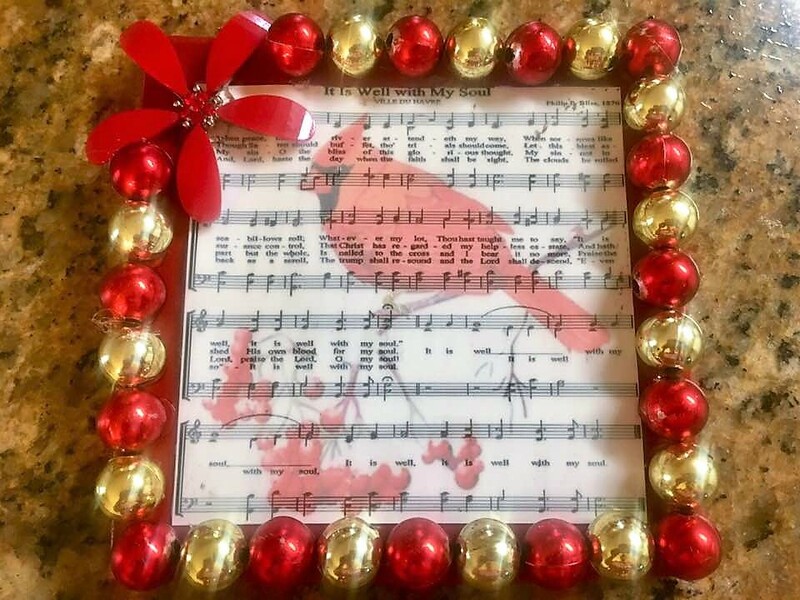 Your DIY with one of my favorite hymns is just beautiful, that would make fabulous Christmas gifts. The little sweetie at the bottom of your post is SO adorable! Thanks Pam. I might have to doll up my gingerbread men next time. LOL! Yes, I too love that song. So sweet. Love the old and new version but when I heard my oldest granddaughter sing the new version....well, need I say more? LOL! Cindy I am glad to see the crafting bug bit you. I love that adorable ornament and commend you on your ingenuity in solving the heavy problem. I think you should make a bunch of them and give them to all your daughters so they can have them on their trees too and think of you each year. And of course you saved the best for last, the little cutie is growing so fast. God bless! Thanks Mary. Girl, you amaze me with your projects. I only wish I had just a tad of your crating skills. Hugs to you. Well, hats off to you Cindy, good job and the best part is you had fun. I can't believe that little one is already so big. My goodness, time flies by. Happy week! Thanks so much Lea . I love it all! That's one of my favorite songs, too, and you know how I love the red birds! What a gorgeous sign, and it'll look perfect behind your table. I'd love to get live close to you, my Friend, so we could craft, laugh, cry, pray...whatever!! 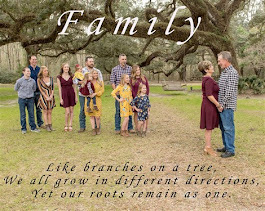 That grand baby is absolutely gorgeous, just like her sister, and all your sweet grands. Being a Grandmother is the absolutely greatest! HOPE you have a great day...love you bunches! Yes I know you love red birds. They are so beautiful. Yes mam we would have a lot of fun for sure. I love being a nana. Your creative mood produced such pretty things. But, the cutest creation is your little granddaughter. Thank you Ashley. I packed it up with my Christmas...the one that was on my tree. The first one I made on wood I think I might just sit that one on an easel. Glad you stopped by. Happy day to you, my friend! It was so good to pop in for a visit as I have missed you and your sweet blog. I so enjoyed this post and oh, I LOVE the ornament you made. My Grandma Betty loved cardinals and when I see them I think of her. I hope your New Year is off to a blessed start. Love and hugs to you! Awe, I was so glad to see your post and the pictures...WOW! I too love those pretty red birds. Love it when I see one too. Hugs to you. Loved it all...from the image at the top to that little happy Grand at the end. Your cardinal picture is so pretty...loved the Christmas ornament you made. You are so creative, my friend. Thanks Nancy. Girl, no worries. I've been some kind of slow on everything these days. LOL! Wow! 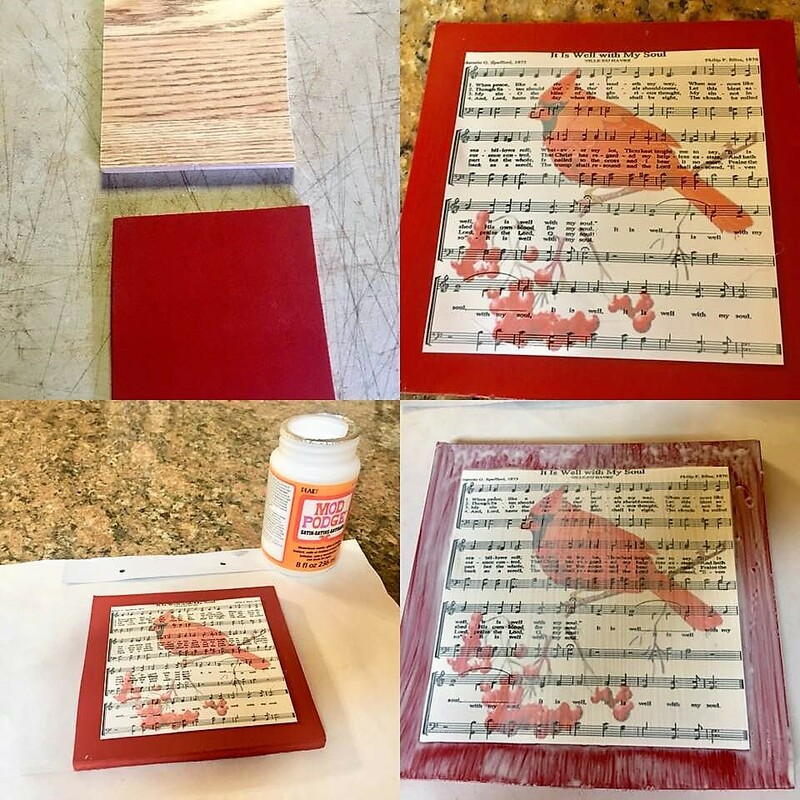 That was a neat project with one of our favorite hymns and then adding the Cardinal...what a great idea. I would think you could still use the one on wood as a plaque to hang somewhere by itself. You are very clever, and you inspire me to do things, but I haven't a clue how to get started. I frustrate myself when I try because I don't have all the stuff I need to complete the project and I give up too soon. Maybe when this house is sold and we get settled I can become more "crafty". Your gingerbread men look so cute. I know the grands loved them. I would too. The wreath project next to the sign it a great idea...can't wait to see it finished. Your sweet little grandbaby girl is so precious, you just want to eat her up, I know!! Love her onesie! I know you have to be the most fun Nana ever!! What a blessing to be able to enjoy your grandbabies, even as they get bigger. YOu are truly blessed, my friend. Thank you for sharing all the fun with us. Wish I lived closer to you. I could sit and watch! LOL. Awe Pam....Girl, I always have these big ideas on projects and I am telling you that the older I get the more I can put stuff off with the best of them! I loved her little onesie too. Just made this old nana smile. Thank you Marilyn . I’ve put off putting something on that wall because i could never find what i liked . Well, i didn’t have . A lovely gift from a friend now hangs there . My wreaths are up too now . Yes, she is adorable! You gingerbread "guys" turned out so good. Love them. Something I have never tried to make. Course you know that I am fond of the red birds. So pretty. Mom loved to sit on the deck and watch them and the Eastern blue birds. I love making Gingerbread cookies for the kids. 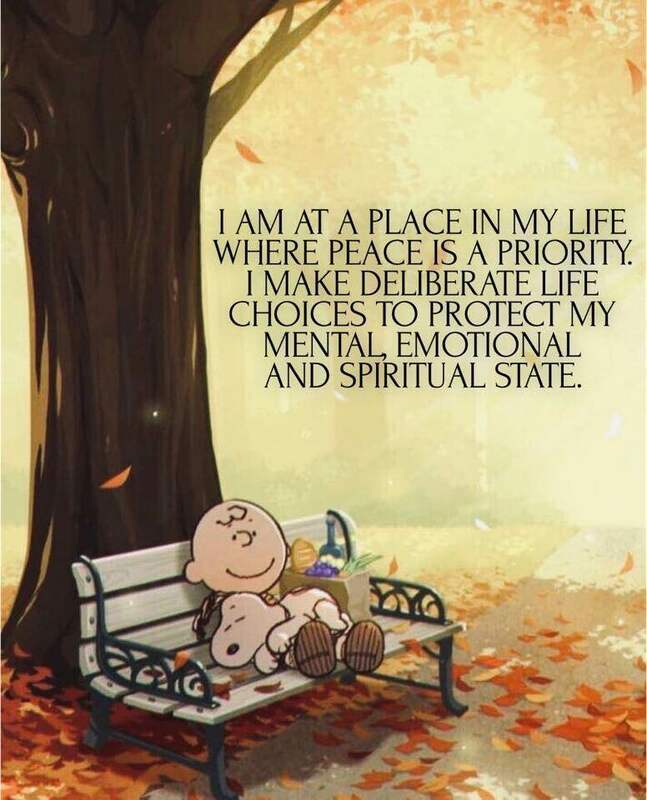 And yes I feel the same as you with that cute Peanuts Meme. I also spotted a little adorable doll to die for !! I used to love to watch the red birds out our window at our past farm home and so did the girls. Hope you are enjoying your weekend pretty lady. I love your post Cindy, everything is wonderful. I will spend the night with a very blissful heart. Thank you, and you bring joy to bloggers like me. What a wonderful post, Cindy! Look at you, so clever and creative, love it all! And Debbie does take fabulous photo's, oh my. Oh my, you are a Nana too, so fun! She's darling and those cheeks are just to cute! I'll be praying for Debbie. Thank you Nancy . That baby girl is so sweet . Thank you for orsyibg too for our friend . She is precious .